JSC „Tandemus“ has been established on the 13th of March, 1996 in Varėna. In the first year of its existence the company was engaged only in a wholesale trade of forest mushrooms and berries.In 1997 the manufacture of wooden baskets and boxes for packing of mushrooms, berries, fruits, vegetables, bread and other food products was started. - Services of the bonded warehouse. Developing its business our enterprise is constantly taking care of the quality and its complience with the highest requirements of the customers, analyses the influence upon the environment and expands the activity so, that to maintain clean natural environment and to retain biological variety. JSC „Tandemus“ is certified as follows: the Quality Management System acc. to LST EN ISO 9001:2008 and the Environmental Management System acc. to LST EN ISO 14001:2005. In order to enlarge the covered market part and to remain competitive, our enterprise is aiming to improve the quality of production by modernizing industrial processes, implanting innovations and enlarging productivity and industrial capabilities. Thanks to the innovative industrial base JSC „Tandemus“ is able to offer the qualitative products for the competitive price. It motivates consumers to choose the products of our company and at the same time the base of loyal suppliers and buyers is being widened. In JSC „Tandemus“ constantly work about 110 persons, whose experience in this business is considerably more than one year. During the season, in addition about 250 workers are employed, including schoolchildren, students and pensioneres. Longtime experience and gained competence allows to react operatively to innovations and changes in the market. Basically our production is realized in Germany, Italy, Austria and Switzerland. We buy raw material from all teritory of Lithuania, from Latvia and CIS countries. Geographically wide suppliers base ensures the constant supply of raw material. All raw material suppliers are established in ecologically clean regions. 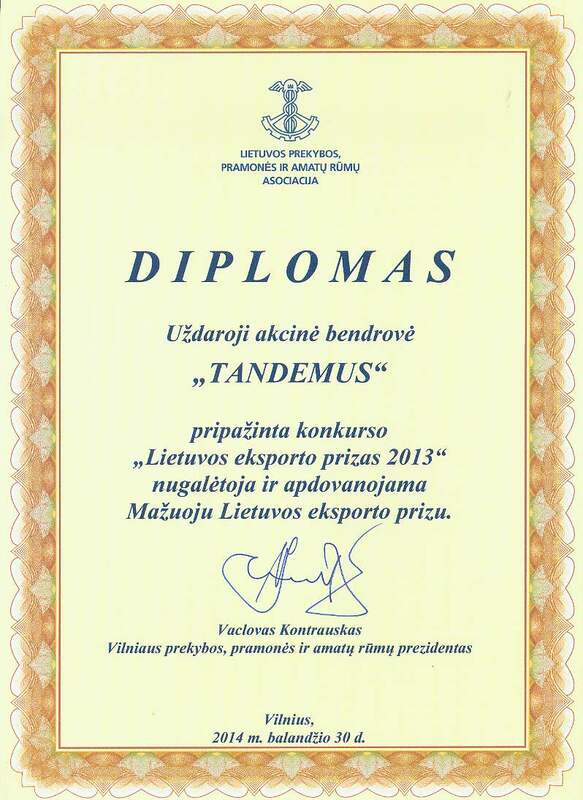 The stability of JSC „Tandemus“ is ensured by activity-experience and extensive cooperation with business partners. JSC "Tandemus" undertakes not to violate the legislation of the legal person activities. The enterprise doesn't have and didn't have any subsidiary or associated enterprise. Quality, flexibility and reliability are our priorities. Professionalism, efficiency, inovations and responsibility are our main values. Since July this year, the assortment of products has been suplemented with frozen herbs. Cutted dills and cutted parsley. From the 1st of November, 2014, JSC "Tandemus" starts a retail and wholesale trade of fresh champignons, frozen vegetables and fruits.